Part of the ongoing evolution of Carr Group’s branding, this logo design is derived from the Carr logo that we redesigned back in 2016. The Green Initiative is an exciting, new environmental programme under development by Carr Group. We’ve been tasked with creating a logo and brochure design for this programme. 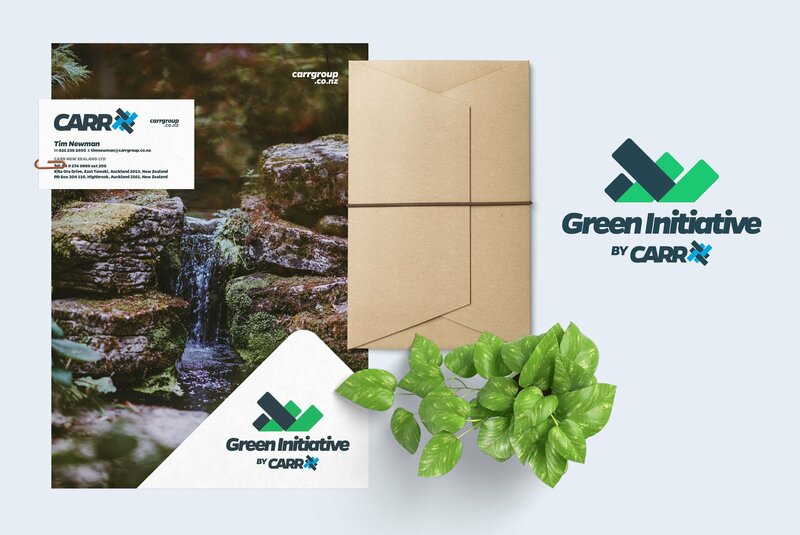 With their Green Initiative, Carr Group is embarking on an innovative journey within the print media game. Our aim with this logo design and branding as a whole is to engage its audience and inspire them to join the ride. In a happy coincidence, the Carr logo icon in and of itself works really well as a representation for the themes driving their environmentally focussed Green Initiative. This gave us a great starting point when designing a logo for the Green Initiative. Rather than use the full Carr # decal, we’ve cropped it in half, along the x axis, providing a level of distinction from the Carr brand. Of course, replacing Carr’s blue with green for this logo was a no-brainer! We wanted to give this important programme a distinct life of its own. If we were to take the easy way out and simply re-use the full Carr # decal, the resulting logo would compete with its parent, rather than set it aside as an extension of Carr Group. The upward direction of the shafts in the logo icon also evoke thoughts of sprouting and growth. We’ve kept some original elements of the Carr logo – font; gunmetal grey colour – and created something new. This is what we call branding evolution. To introduce the Green Initiative to Carr’s clients and prospects, we’ve created a four-page A4 brochure design. Sure, we could have squeezed the content onto two sides of an A4, but we felt that the result would have less visual impact. This format allows us to create a high-impact, minimalist cover, and an opportunity to reinforce the Carr branding. Our team are talented content creators. We can take a few notes from our clients and whip them up into unique, engaging content and create a finishined article, be it a full website or a brochure. That’s what we’ve done for this new project for Carr Group. We’ve deconstructed the notes provided to create the Green Initiative brochure as well as a number of more details pages on their website. From the resulting drafts it’s easy for our client to review and make changes to the finished product. It’s all part of a full service from Hart Design. Like this branding evolution? Check back soon – we’ll add more graphic design imagery as this project continues to unfold. Plus we’ll be developing content on Carr’s website to showcase this new programme. Looking to evolve your brand as your company grows? Future-proof your branding with our team of Auckland branding experts. We’re a creative design agency specialising in brand development and website design.